"Gas Gas" is also a song from the Croatian musician Severina (Album: Zdravo Marijo). Gas Gas is a Spanish motorcycle manufacturer, specialising in off-road motorbikes. Gas Gas are best known for their trials bikes, although they also make successful enduro and quad bikes. Gas Gas emerged from the financial demise of Bultaco when two agents, Narcìs Casas and Josep Pibernat, found themselves with a shop but no product to sell. So they embarked on a programme to manufacture trials motorbikes for sale in their shop. Gas Gas have manufactured and sold motorcycles since 1985. A majority of the Gas Gas models are still handbuilt at the Gas Gas factory in Salt (near Girona), in Catalonia. Gas Gas began manufacturing trials bikes in 1985, enduro and motocross bikes in 1989, and quads in 2002. Gas Gas trials paddock, Duluth, MN 2004. In 1993, Gas Gas succeeded in luring the multiple world trials champion Jordi Tarrés away from Beta and he promptly won three successive world trials championships (1993, 1994 and 1995) for Gas Gas. More recently Gas Gas have won the Trial Outdoor World Championship twice (2005 and 2006) with Adam Raga. They have also won the Trial Indoor World Championship in 2003, 2004, 2005 and 2006 also with Raga riding. Gas Gas have also been successful in the World Enduro Championship. Paul Edmondson won the 125 cc world championship in 1994 and the 250 cc class in 1996, Petteri Silván the 250 cc and the overall championship in 1999, and Petri Pohjamo the 125 cc class in 2003. In 2006, British Enduro Champion Wayne Braybrook, riding a Gas Gas, was one of only two riders to finish all 80 miles of the Red Bull Last Man Standing event. 126 other riders did not finish the race. The name Gas Gas literally means "to gas it" (to accelerate, give it the gas, turn the throttle - to go faster.) The Gas Gas founders have, at times, expressed misgivings about the chosen name inasmuch as that name causes confusion outside Spain. Others have joked that Gas Gas are so good that they had to name them twice. The slogan "Gas Gas = Fast Fast" was used by the US importer, Gas Gas North America, from 1999–2002 to try to help people understand the unique name. Gas Gas bikes are currently imported into many countries in Europe and around the world, including Australia, New Zealand, Canada, South America, South Africa and the United States. 2005 MC 250 Motocross bike. While the EC ("Endurocross") and MC (motocross) models are shipped worldwide, Gas Gas have manufactured specialized models for the United States off-road market. The XC ("Cross Country" produced from 1999–2002) and the DE ("Dealer Edition" produced from 2002–2006) models were successful attempts to customize the product to the US market. The FSE and FSR are the fuel injected, four-stroke enduro bikes similar in appearance to the EC models. Prior to 2007, each color on the EC model line represented the engine displacement range of the motor. Yellow – 125 cc and 200 cc. Red – 50 cc, 250 cc, 400 cc and 450 cc. Blue – 300 cc, 450 cc. In 2007–2009, the company standardised to the colour red for all displacements and models. As of the 2010 model year, all standard EC models are black with red and white accents. The "Six Days" edition uses white plastics with red, yellow, and black accents. The "Racing" models are white with black and yellow accents. The TXT models are specifically designed for trials riding. The TXT trials model line also used a similar color code to the EC line. The Gas Gas sport quads are known by the Wild HP brand and come in two-stroke and fuel injected four-stroke models. Prior to 2007, the Wild HP line of quads were available in choice of blue or red regardless of displacement. Beginning in 2007 the Wild HP line standardized to black. Wikimedia Commons has media related to Gas Gas. Aprilia is an Italian motorcycle company, one of the brands owned by Piaggio. Having started as a manufacturer of bicycles it moved on to manufacture scooters and small-capacity motorcycles. In more recent times Aprilia has produced large sportbikes such as the 1,000 cc V-twin RSV Mille and the V4 RSV4. Aprilia has enjoyed considerable success in road-racing. KTM AG is an Austrian motorcycle and sports car manufacturer owned by KTM Industries AG and Indian manufacturer Bajaj Auto. It was formed in 1992 but traces its foundation to as early as 1934. Today, KTM AG is the parent company of the KTM Group. Motocross is a form of off-road motorcycle racing held on enclosed off-road circuits. The sport evolved from motorcycle trials competitions held in the United Kingdom. There are many systems for classifying types of motorcycles, describing how the motorcycles are put to use, or the designer's intent, or some combination of the two. Six main categories are widely recognized: cruiser, sport, touring, standard, dual-purpose, and dirt bike. Sometimes sport touring motorcycles are recognized as a seventh category. Strong lines are sometimes drawn between motorcycles and their smaller cousins, mopeds, scooters, and underbones, but other classification schemes include these as types of motorcycles. Montesa Honda is the Spanish subsidiary of Honda, which assembles several models of motorcycles, bicycles and parts at its Barcelona plant. The company exports 75 percent of its production to Europe. Husaberg was a manufacturer of enduro motorcycles with four and two-stroke engines, the displacements ranging from 125 cc to 650 cc. Originally based in Sweden, its motorcycles were latter manufactured in Austria by parent company KTM until the line was retired in 2014. 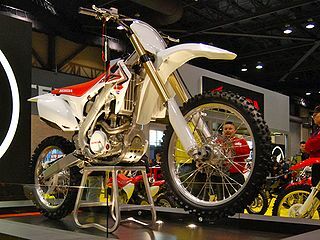 The Honda CRF series is a line of four-stroke motocross and trail motorcycles manufactured and marketed by Honda. SV.VM was an Italian motorcycle manufacturer founded in 1971 by Piero Sironi and Fausto Vergani. Based in Milan, Italy, SWM manufactured Observed Trials, Enduro, Motocross and off-road motorcycles in the 1970s and 1980s. They started with small capacity Sachs engined enduro bikes and began making Rotax engined trials bikes in 1977. The other main manufacturers at this time included Fantic Motor, Bultaco and Montesa. Making the announcement during EICMA 2014 show in Milan, SWM are back on the market by introducing six street and off-road bikes with engine size between 300 and 650cc. Sherco is a French and Spanish motorcycle manufacturer, specialising in off-road motorbikes. Sherco are best known for their extremely popular trials bikes, although they also make enduro and supermoto bikes. Ossa is a Spanish motorcycle manufacturer which was active from 1924 to 1982 and reborn in 2010. Founded by Manuel Giró, an industrialist from Barcelona, Ossa was best known for lightweight, two-stroke-engined bikes used in observed trials, motocross and enduro. The company was known originally as Orpheo Sincronic Sociedad Anónima (O.S.S.A.) and was later renamed Maquinaria Cinematográfica, S.A.. In 2010, the Ossa brand was reborn when the trademark was purchased and a new company began producing motorcycles. An enduro motorcycle is an off-road racing motorcycle used in enduros, which are long-distance cross-country time trial competitions. Beta is an Italian motorcycle manufacturer, specialising in off-road motorcycles. Beta are best known for their popular trials bikes. In 2005, they launched a range of enduro motorcycles using KTM engines. In 2010 they launched the new RR series, with a new engine made in-house. Beta motorcycles have been used by world trials champions such as Jordi Tarrés, Dougie Lampkin and Albert Cabestany. The Yamaha YZ450F is a four-stroke racing motocross bike built by Yamaha Motor Corporation. It was the successor to the previous YZ426F which was discontinued in 2003. It is credited by Cycle World and Dirt Rider magazines as the bike that started the four-stroke dirt bike revolution. The 2006 YZ250F and YZ450F were the first production motorcycles equipped with titanium suspension springs. Husqvarna Motorcycles GmbH designs, engineers, manufactures and distributes motocross, enduro, supermoto and street motorcycles. The KTM 450 EXC is a 4-stroke enduro off-road motorcycle made by KTM. The models are the European road legal 400 EXC and 450 EXC, the US 450 XC and 450 XC-W. The European EXC versions have a small headlight, speedometer, tail-light and somewhat softer linkless (PDS) rear suspension. The US EXC is 50-states street legal. Rupp Industries was a Mansfield, Ohio based manufacturer of go-karts, minibikes, snowmobiles and other off-road vehicles founded by Mickey Rupp in 1959. Rupp Industries operated from 1959 until bankruptcy in 1978. Rupp vehicles are known for their performance and bright red coloring, particularly the snowmobiles and off-road vehicles. They have since become extremely collectible. The KTM 300 is a series of 2-stroke enduro off-road motorcycles made by KTM. They are the Penton-inspired 1984 300 GS, the 300 DMX, the dirt only 300 MXC, European road legal 300 EXC and their current US counterpart the 300 XC (close-ratio) and 300 XC-W respectively. The KTM 300 is designed for difficult off-road conditions. The 300 EXC and the 300 XC-W have a small headlight, speedometer, tail-light and somewhat softer linkless PDS suspension. Starting in 2009 all 300's came with electric start.